Prior to covering krav maga weapon defenses, we need to revisit a few of krav maga’s control holds, two of which are known as cavaliers. Cavaliers are designed to use your powerful hip muscle groups and bodyweight to torque an opponent’s wrist to take him down while establishing strong control over the weapon for removal. Prior to covering krav maga weapon defenses, we need to revisit a few of krav maga’s control holds, two of which are known as cavaliers. Cavaliers are designed to use your powerful hip muscle groups and bodyweight to torque an opponent’s wrist to take him down while establishing strong control over the weapon for removal. There are two types of cavaliers frequently used in krav maga. Cavaliers are preceded by retzev combatives (continuous motion without thinking of your next move) against the assailant, including full-force strikes to the groin, neck, eyes, and other vulnerable opportunistic targets. 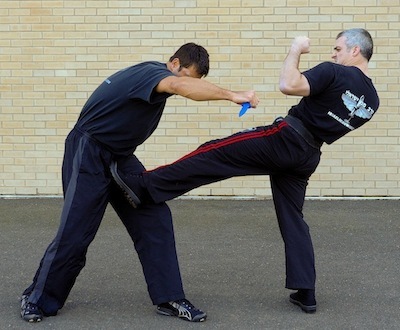 Control holds are used in krav maga to remove blunt and edged weapons and, sometimes, firearms from the assailant’s grip. This powerful takedown places enormous pressure on an opponent’s wrist, forcing him down to the ground while placing strong control of the weapon. If necessary, you can follow up with a strong kick to the head, midsection, or groin along with an arm bar or wristlock to remove the weapon. Cavalier #2 is used when you have wrapped up the opponent’s weapon arm from the inside such as when using an instinctive defense to defend an underhand edged-weapon attack. Rotate the assailant’s hand to the inside by applying a joint lock to his shoulder and elbow. The Cavalier #2 wristlock involves moving from the inside control of the edged weapon-arm by trapping the assailant’s arm across your chest. Cavalier #3 is used when you have wrapped up the opponent’s weapon arm from the inside and find it easier to keep the arm wrapped and trapped to apply a wristlock for weapon removal. Similar to Cavalier #2, the Cavalier #3 wristlock involves moving from inside control of the edged weapon arm by trapping the assailant’s arm across your chest. This highly practical and effective control hold allows an assailant to be taken down face-first, swiftly with strong dead side positional control, and driven into the ground with dominant control over the weapon. Control Hold A may also be applied with or without preceding retzev combatives. Again, usually in the case of a weapon, the defender has delivered strong preceding combatives and has control of the weapon arm before applying the specific hold. The hold places compliance or takedown pressure on the opponent’s wrist and shoulder while controlling the weapon. Hand defenses are used when (1) the assailant closes the distance; (2) you are in a close-quarters combat situation; or (3) you are surprised by the attack. 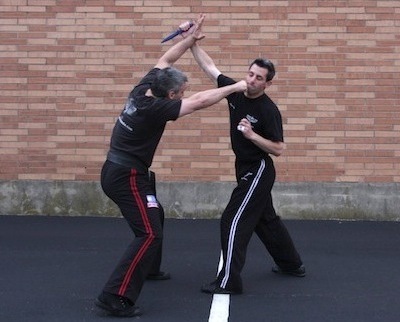 This defense thwarts the most typical edged-weapon attack, the overhead stab, when you are too close for leg defenses. In other words, you do not recognize the attack early enough to use leg defenses or find yourself in a confined space where leg defenses are not an option. All krav maga weapon defenses, when possible, move off the line of attack combined with defense and attack. This defense primarily relies on your instinct to block and move away from a blow, or, in this case, a stab. The defender does not have time to stop the attacker’s arm as he draws it back to stab. The assailant has the edged weapon in his right hand and is facing you. This attack can involve tremendous force as the assailant presses all of his weight into the attack and uses gravity to his advantage. The defense involves a simultaneous three-part movement. You must (1) deflect-redirect the assailant’s right-edged weapon hand using an outside block by rotating your left arm (nearest to the edged weapon) outside to intercept the assailant’s right arm while not breaking contact for control; (2) simultaneously strike the assailant in the face or throat with your right hand, as you (3) step forward and diagonally with your outside right leg taking you off the line of attack and into weapon control. Recall that krav maga’s defenses must work for everyone and do not rely on strength. When confronting a larger stronger assailant, if you do not step out off the line of attack, this disparity in body mass and strength could overcome your arm block even if you throw your bodyweight behind it. If you simply “burst” into the attacker, there is a considerable risk you will be stabbed (or in a different attack, slashed). Stepping out takes you off the line of attack and will work against an overhead long edged weapon or a machete stab. When using a strong block, you may find that your hand naturally curves slightly upward. Strive to deflect the edged weapon as close as possible to the assailant’s wrist while maintaining contact with the assailant’s arm after the initial block. After stunning the assailant, you have the option of pressing the counterattack by transitioning immediately from the block to securing the assailant’s arm. In other words, block the attack by rotating your left arm outward and then immediately slightly rotate the arm back to grab and secure the assailant’s right wrist. This is done while stepping slightly to the side and away from the assailant. Immediately secure the assailant’s arm and drive it back while delivering punishing knee strikes to the groin or thighs. Keep in mind, after the deflection and without attempting to control the arm, you may simply kick him in the groin and retreat. It is paramount that after you take a step away from the attack to then drive the assailant’s arm backward for control. After stepping off the line of attack, driving the assailant’s arm back serves two purposes: (1) it prevents the assailant from initiating further stabs, and (2) it positions the defender to apply a strong control hold, in this case the options of Control Holds A or Cavalier #1. Control Hold A (known to some as the “kimura”) secures the assailant, driving him face-down, importantly placing strong control over the edged-weapon hand. Control the edged weapon and remove it with precision from the assailant’s grip. Secure the weapon at the bottom of the hilt and pry it loose with your right thumb from the assailant’s grip toward his head. Another option is to keep the assailant’s elbow pinned to your body and release your left hand from the attacker’s wrist and inserting your thumb to pry the edged weapon. You should remember that kravists train to use wrist releases and scissor leg takedowns. In a fight, an assailant could use the same release against you. Wrist releases, when holding a blade, present special dangers because not only can the assailant release, he can slash and stab while doing it. You may also use Cavalier #2 to remove the edged weapon and remain standing. A second option to defend the attack uses the primary defense to block/sidestep and counterattack but breaks contact to deliver a swift, strong, left straight kick to the groin with a good base leg turn. This is a strong option because the attacker’s arm will bounce off your deflecting arm and can be difficult to control. The sidestep places your right leg forward with your weight on it to take you off the line of attack. Because the step shifts your weight to your right leg, your left leg is positioned to deliver a debilitating left straight kick to the assailant’s groin. This shift, in turn, allows you to quickly disengage while continuing to break the angle (moving away from the edged weapon). For law enforcement, security, and professional security personnel, this variation also allows you to deploy a firearm or impact weapon you did not originally have time to use. A third law enforcement, professional security, or military specific option is to complete the block/sidestep and counterattack, and then immediately draw and instinctively point shoot the assailant. Note: Blocking and simultaneously drawing the weapon is not an optimum tactic because the assailant is coming at you full speed and force, likely with repeated stabs, and you have not yet stunned him. Instead, you are relying on your ability to deploy and successfully use your weapon, which, unfortunately, has had fatal consequences for many police and security officers. (A different technique must be used if the defender has the sidearm on his left hip.) You should continue to move away from the edged-weapon arm. In short, this defense can be combined with an initial strike to momentarily stun the assailant, create distance, and then deploy a firearm.